Searching For Pizza in Cleveland? Rascal House Is a MUST!!! Here at the Rascal Headquarters, we love hearing how people enjoyed their visit with us, so when we found out that blogger Thoughts of RS at thoughtsofrs.blogspot.com had a great time at Rascal House, we wanted to share it. 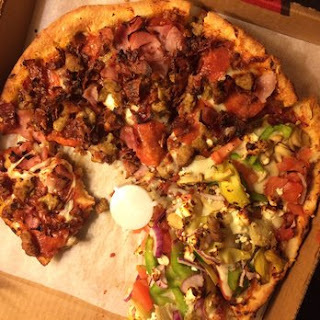 “In researching-I discovered that most people think that Rascal House ranks as the best Cleveland pizza, so I made a note of that before we left as pizza seems to be a hotel room staple. After the first day of Rachel’s “project” and food,we were all starving,so pizza looked to be the choice. Thank you to Shawn at Thoughts of RS, we are glad you enjoyed a special slice of Cleveland with us. Do you have a Rascal House memory you’d like to share? We want to see! #RascalHouse on Twitter or Instagram, or throw it up on our Facebook page. Comments Off on Searching For Pizza in Cleveland? Rascal House Is a MUST!! !